You may know that high cholesterol is a risk factor for developing heart disease or having a stroke, but what about high triglycerides? Perhaps you can recite your LDL, HDL, and total cholesterol levels by heart. Research says you should also pay attention to your triglyceride number on your lipid panel. When total cholesterol levels are measured after an overnight fast, one number included in the report is the level of triglycerides, a form of fat that travels through the bloodstream. Triglyceride levels that are too high can increase the risk of developing cardiovascular problems. But how high is too high? High (and very high) triglyceride levels are linked to atherosclerosis, a condition in which cholesterol and other substances form plaques within the walls of an artery. If a plaque ruptures, the plaque fragments or blood clots can block the flow of blood in either an artery supplying the heart, which could cause a heart attack, or an artery supplying the brain, which could cause a stroke. There are other important factors in the development of atherosclerosis—above all, the levels of LDL, the so-called "bad cholesterol." Contributing factors to the development of atherosclerosis include obesity and insulin resistance. Insulin resistance is a pre-diabetic condition marked by an impaired response to insulin, the main hormone involved in the transfer of food energy to cells throughout the body. The American Heart Association's scientific statement in 2011 says triglyceride is not a direct cause of atherosclerosis but it is a marker of cardiovascular disease risk. Obesity: Excess weight generally increases the blood level of triglycerides. Medical Conditions: Diabetes, kidney disease, low thyroid function, and liver disease are all associated with elevated triglyceride levels. Age: Triglyceride numbers tend to creep up as you age. Poor Diet: Too much sugar or alcohol can increase the amount of triglycerides produced in the liver. Medications: Oral contraceptives, steroids, and diuretics are all associated with high triglyceride levels. Heredity: High triglyceride levels may just run in the family. As a risk factor, triglyceride levels have traditionally been viewed as the sidekick to the other components of the standard lipid panel: total cholesterol, LDL, and HDL (the "good cholesterol"). Elevated LDL levels have been deemed the prime suspect in the development of stroke. But research published in 2008 suggests that, when considered on their own, triglyceride levels have a strong link to stroke development. Over a four-year period, researchers at the University of California, Los Angeles collected data on more than 1,000 patients who were admitted to a university medical center for transient ischemic attack (TIA), also referred to as a "mini-stroke." TIA is a condition in which an artery is temporarily blocked by a blood clot, but does not result in permanent symptoms or disability. All of the study patients had fasting lipid panels drawn the day following admission to the hospital. By comparing these lipid panels, researchers found that the patients with the highest triglyceride levels were 2.7 times more likely to suffer a stroke than those with low triglyceride levels. LDL levels, however, showed no correlation to stroke risk. Of course, LDL is not completely off the hook. LDL tends to be higher in stroke patients when compared to healthier subjects. Elevated LDL levels are also linked to an increased risk of developing coronary heart disease. Lose Excess Weight: If you are overweight, losing 5 to 10 percent of your body weight may lower your triglycerides as much as 20 percent. Exercise: Physical activity helps rid the body of excess fat, but even without weight loss, exercise can decrease the levels of fats in your blood. Choose Fish Instead of Steak: Meat, such as steak or pork, is high in saturated fat, but fish (especially deepwater, fatty fish such as albacore tuna and salmon) are high in omega-3 fatty acids, which helps to fight off high triglyceride levels. Be Cautious About Cocktails: Even moderate alcohol intake can considerably elevate triglyceride levels. On the other hand, moderate alcohol consumption also helps boost your HDL, the "good cholesterol," making this a complicated issue and one worth discussing with your doctor. 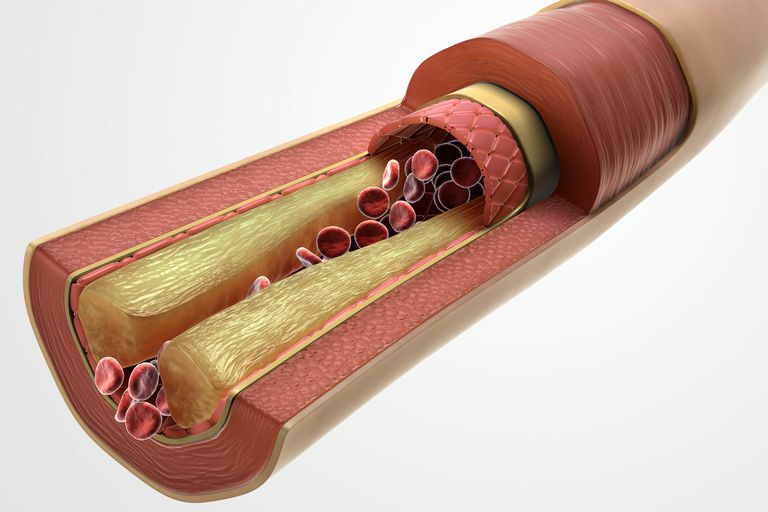 Atherosclerosis and Stroke. American Heart Association. http://www.strokeassociation.org/STROKEORG/LifeAfterStroke/HealthyLivingAfterStroke/UnderstandingRiskyConditions/Atherosclerosis-and-Stroke_UCM_310426_Article.jsp#. Bang OY, Saver JL, Liebeskind DS, Pineda S, Ovbiagele B. Association of serum lipid indices with large artery atherosclerotic stroke. Neurology. 2008;70(11):841-847. doi:10.1212/01.wnl.0000294323.48661.a9. Miller M, Stone NJ, Ballantyne C, et al. Triglycerides and Cardiovascular Disease: A Scientific Statement From the American Heart Association. Circulation. 2011;123(20):2292-2333. doi:10.1161/cir.0b013e3182160726. Stone NJ, Robinson JG, Lichtenstein AH, et al. 2013 ACC/AHA Guideline on the Treatment of Blood Cholesterol to Reduce Atherosclerotic Cardiovascular Risk in Adults. Circulation. 2013;129(25 suppl 2). doi:10.1161/01.cir.0000437738.63853.7a.